I was fortunate enough to experience their services a few weeks after their opening and was able to share my thoughts and review about them on my social media vlogs I posted on Facebook. I'm sort of liking more to upload my videos on Facebook rather than YouTube because it's a lot faster and convenient on my part. So please do check out my videos about Roman Baths on either my personal Facebook page or at the official Facebook page of Wazzup Pilipinas. Speaking of faster, I'm experimenting on vlogging instead of blogging since I want to improve this particular craft that could be useful in public speaking or hosting. It teaches me to effectively share my thoughts, and boosts my self-confidence. Incidentally, body scrubbing also helps in many ways to improve both our external and internal features. This is because scrubbing smoothens skin texture, minimizes pores, prevents acne and break-outs, fights signs of aging, evens out skin tone, allows better absorption of skin products and improves blood circulation. Treat yourself to Roman Baths Scrubbing Salon signature natural scrubbing services that will leave you feeling lighter, cleaner and more refreshed! I experienced a Body Scrub for only P720 and a Facial Scrub for only P380 last Wednesday September 4. Ask me about it! Visit them at the 5th Floor Building A of SM Megamall. Call 09237297292 to book for an appointment. Below is the official press release given during the launch. Previously, everyone thought that scrubbing was a luxury that only the rich could afford, as it was often offered as a side service to massage packages. Now everyone can enjoy quality exfoliation at reasonable prices. Roman Baths Scrubbing Salon and their specialized & professional skin scrubbing services goes beyond the usual pampering options being offered in the market today. This salon, owned by Ocel Fabian and Merci Hilario, promises to make its mark by making skin exfoliation an important part of one’s regimen. Roman Bath’s services range from a very affordable knee or elbow scrub valued at Php 160 to a thoroughly relaxing Body Scrub package (complete with massage) priced at P720. Roman Baths Scrubbing Salon uses natural ingredients like Himalayan salt and brown sugar which gently scrub out the dead skin, dirt and grime from your skin’s pores, making you feel clean and refreshed. These scrub basics, mixed with oils such as Chamomile, Lavender, and Green Tea, offers its patrons the perfect ambience of tranquility and calm. “Our therapists are trained to give our clients a uniquely memorable scrubbing experience that will leave them wanting to come back for more. 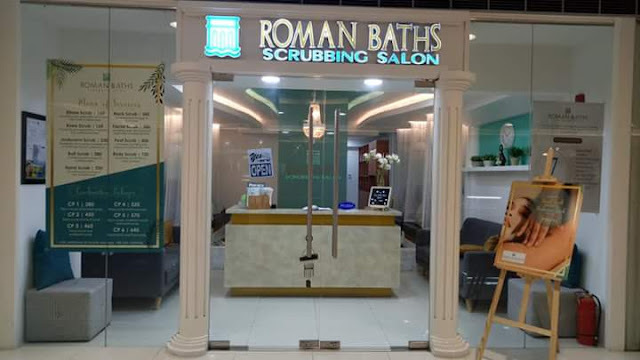 We make sure that we only give the best quality scrubbing service even as we make it accessible to more Filipinos,” says Merci Hilario, co-owner of Roman Baths. Enjoy an ultimate body scrubbing at Roman Baths Scrubbing Salon, located at 5th Floor SM Megamall, Building A. Open d aily from 10am – 10pm. You may book an appointment at +639237297292 or at rbscrubbingsalon@gmail.com. To know more, visit facebook.com/romanbathsmanila/ or follow us on IG @romanbathsmanila.